Dramatic world events and high-profile personalities have recently seized the spotlight and made headlines. But that doesn’t mean nothing is going on in our field of hacker tech. This past week Ubuntu brought out its latest 16.04 LTS version of Linux for the Raspberry Pi. Also new is a first cut at programming libraries for the newly released ESP32, under the Arduino IDE. 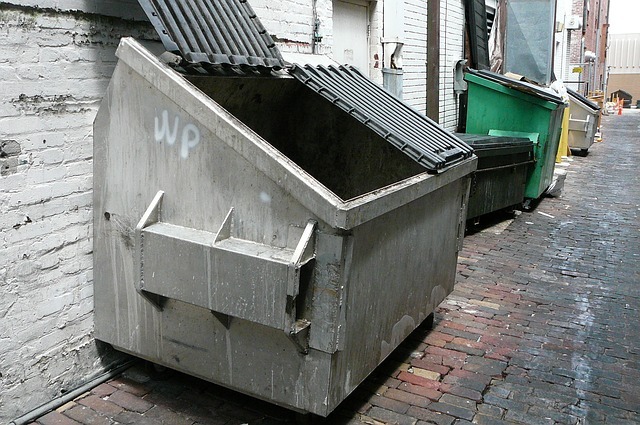 I’ll discuss those developments and I’d also like to share my recent adventure in covert recycling, by way of a roll-off dumpster I found near a recently closed jewelry store. A five-minute spelunking session returned a bounty of raw materials, recyclable parts and electronics for future projects. Let’s dive right into the latest Off-The-Shelf Hacker news, trends and adventures. Everybody knows I’m a big Linux advocate and currently run Xubuntu on my notebook. Xubuntu is basically standard Ubuntu with the XFCE desktop bundled on top. It’s also widely known that I use ESP8266 chips, Arduinos and all manner of Raspberry Pi boards in my projects. The 8266 and Arduinos are firmware-based, of course. The Pi is Linux-based, usually the Raspbian version, which is without doubt a solid distribution. I always thought it would be convenient, not to mention standardizing, to have Ubuntu on both my notebook and Raspberry Pi devices. Ubuntu just announced it’s latest 16.04 LTS Linux version for the Raspberry Pi model 2 and 3. The Raspberry Pi model 2 version is plain-Jane Ubuntu, while the model 3 version has specific tweaks to make it run on the quad-core ARMv8 CPU. Since the model 3 version was built by an outside source, it’s not officially supported by Canonical yet. Make no mistake, Linux is taking over the operating system-capable, micro-controller World. I’ve used the Arduino IDE (integrated development environment) to build firmware for several different models of the Arduino, since the ubiquitous microcontroller came on the scene, years ago. Arduino’s Processing language uses the same IDE and language style if you want to create traditional standalone applications for your notebook or Android phone. Processing and the Arduino go hand-in-hand for physical computing projects. The IDE uses specific hardware-oriented libraries makes it easy to extend the framework to new devices, like the ESP8266. Over the last few months, I’ve built several WiFi-enabled projects using these modules and their associated library. As reported by Hack-A-Day, a first-cut Arduino IDE library for the new ESP-32 was released this week. While the ESP8266 is amazingly awesome for network-enable projects, the next-gen ESP-32 adds onboard Bluetooth, low-power modes and a variety of enhanced GPIO (general purpose input/output) capabilities. Note that the library is a work-in-progress, so some features may not be usable just yet. Sadly, production seems to be a bottleneck for the ESP-32 right now, so getting your hands on the chips might be a little frustrating. Availability likely will affect feature capability development, as well. We may have to be patient because that’s just part of life when prototyping with bleeding-edge physical computing parts. Finally, a jewelry chain close to where I live is moving one of its local stores to a better location, a few miles away. In preparation for the move, the managers brought in a huge roll-off dumpster and threw out piles of old display furniture, countless cardboard boxes (in a hundred different sizes) and a dozen decent-sized plastic storage bins (with lids). No, there weren’t any expensive watches or diamonds to be “mined” while waist-deep in office debris. Rest assured, I checked thoroughly! But there were valuables a plenty for the ingenious hardware hacker. One interesting trinket was an industrial-strength video recording machine. It had several disk drives, a DVD writer, a power supply and about 20 video camera input ports. It must have weighed 30 pounds. The thing looked like it was full of great parts. I chose not to snarf it up mainly because I just don’t need another odd device taking up space in my shop. Along one side, I found about 50 brand-new, gray-colored flooring tiles. You could cut them up with tin-snips any time you need a bit of electrically insulating material or when making a little cover for one of your projects. 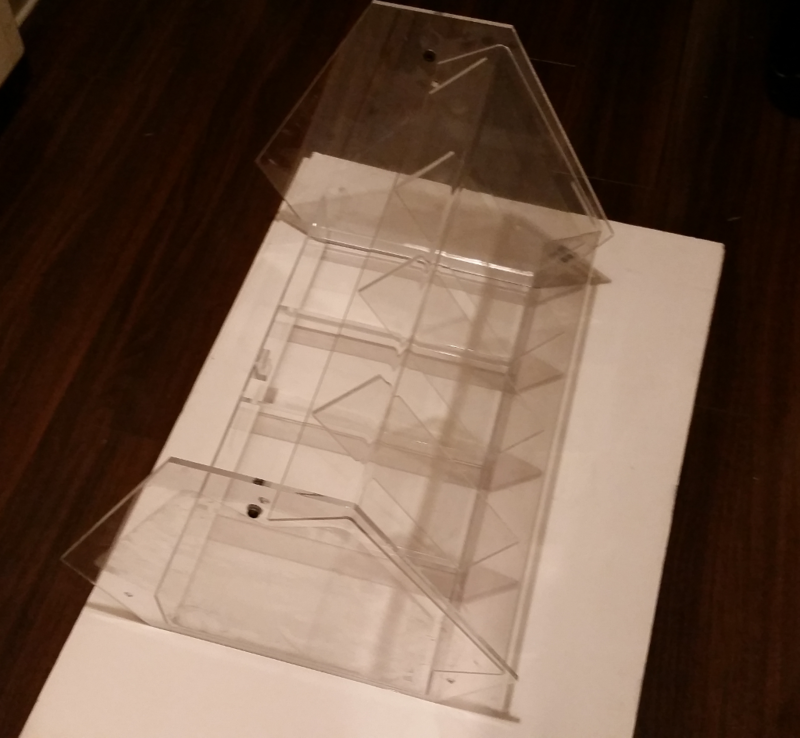 A display stand with 1-foot square, ¼-inch thick clear plastic top and bottom pieces. Those will be great for switch/potentiometer/connector panels on Arduino projects. 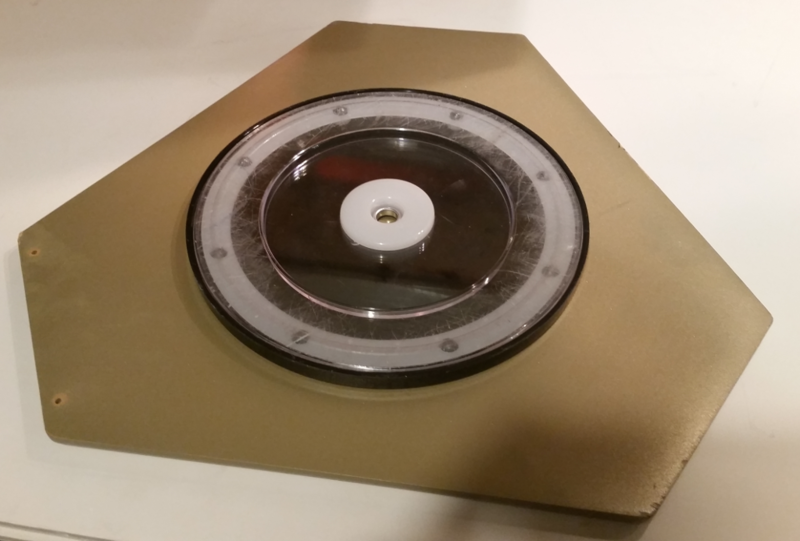 One end had an 8-inch diameter “Lazy Susan” with metal ball bearings. I might use it on some kind of a motorized turntable. Two-dozen 4-inch x 1/8th-inch thick cream-colored plastic squares. These pieces were very rigid and will probably be cut up and bolted together as little project cases. 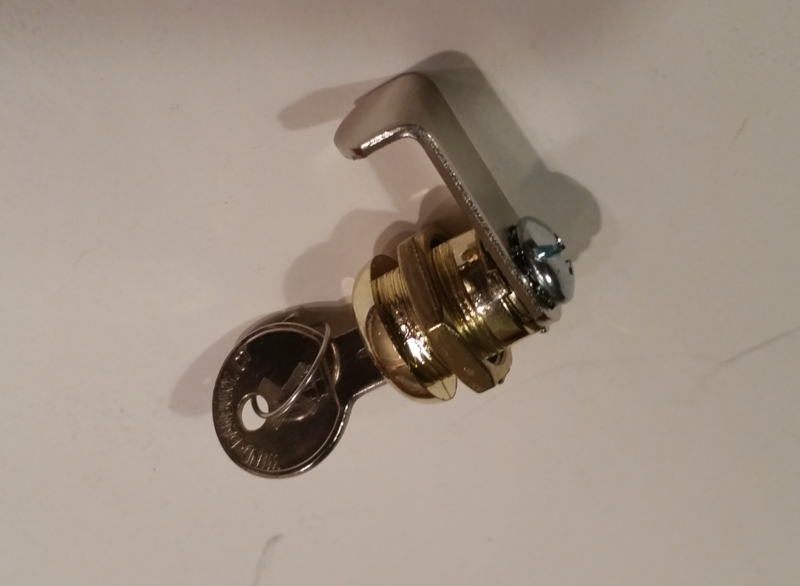 I also saved a plastic display case door with a bolt-on key lock. It even had the key! All I have to do is drill a 7/8-inch hole and it will slip right into a hatch, on one of my projects. Likely I’ll just keep the lock and toss the plastic door. 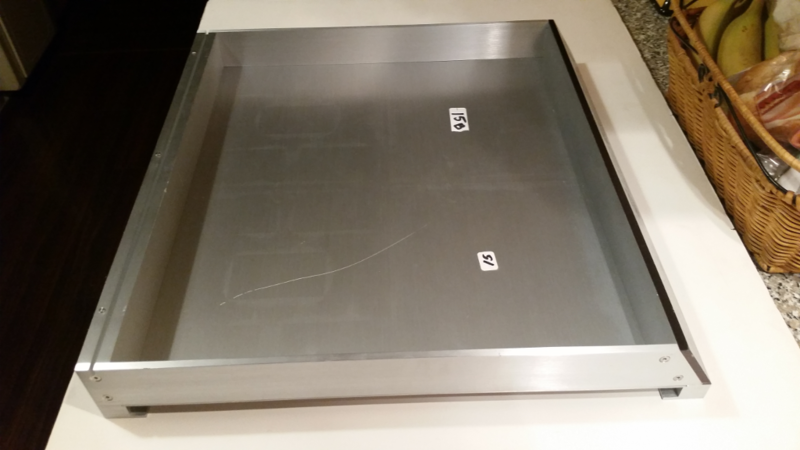 There was also a 16-inch square aluminum panel that looks like some kind of a shallow desk drawer. A nice piece of 3/16-inch aluminum can be sawed into all kinds of cool shapes for projects. Overall, it was a good week. It’s the greatest time in history to be an Off-The-Shelf Hacker.